Hi Everyone! 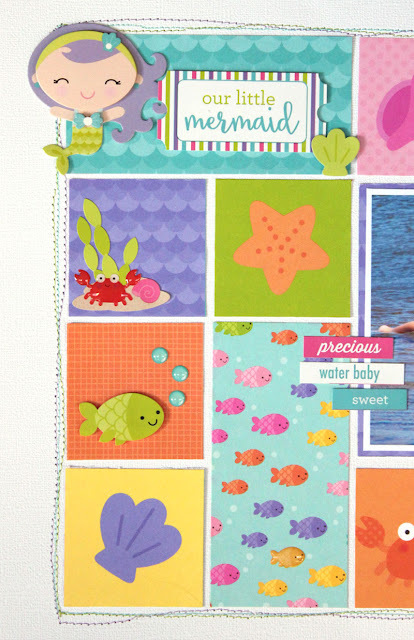 It's Kathy today with a fun layout using the ADORABLE new Under the Sea Collection! My daughter LOVED mermaids when she was little. She always pretended to be one when we were at the beach, so this collection was perfect for me! There were so many cute elements in the collection, I wanted to make sure I used them all!! I opted for a grid design so I could create little scenes. Of course, the Mini Mermaid Doodle Pop had to be part of my design! The mermaid along with the fun sticker from the This and That sheet made up the perfect title! I also added some goodies from the Sprinkles Shapes and Icon Sheet Stickers. And those Bubble Shape Sprinkles...LOVE! To fill in some of my grid I cut the squares from the Coral Reef Cardstock , they have such cute little pictures! Under the Sea is the perfect collection for summer and vacations! There are so many cute elements! 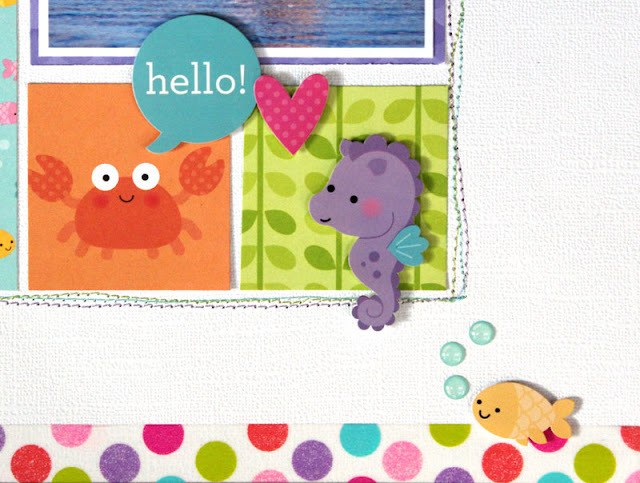 Make sure to check out the blog all next week for more Under the Sea inspiration! That's it for me, thanks for stopping by to peek! Great layout! Love all those squares and the details you added! The grid design is perfect. Such an adorable layout!! Kathy, you did an adorable job with adorable products! I love the bright colors on the white background. Grid is my fave! Great job. I love grid layouts, and this is so bright and sunny! Great job!!! Gorgeous LO! I love how bright and cheery this collection is! The grid design is such a great way to create little vignettes to showcase the darling critters and icons. Beautiful job! Fabulous page Kathy! Love the design and also love the stitching! Perfect! Great colors and love the blocked design!